Set Up: 10x15 grid with one line of players. All of the balls at the top of the grid with the coach. Activity: First and second players in line sprint out. First player is the Attacker, second player is the Defender. When first person gets to the ball, they must put their foot on the ball and try and shield the ball from the Defender. 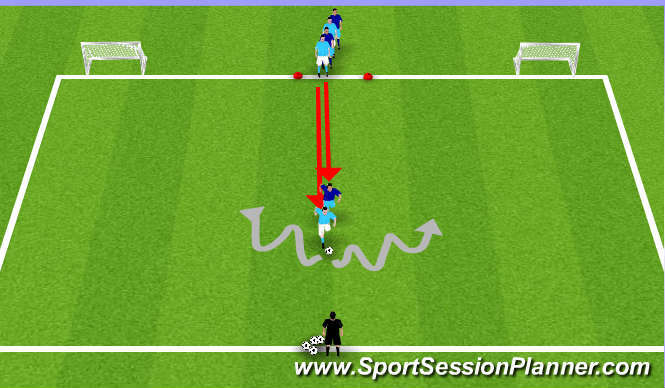 When coach says "GO", Attacker must try and turn on the Defender and can attack either goal. If Defender wins the ball, have them play the ball to the coach for a point. If there are even numbers, make sure to designate one group Attackers and one Defenders, then switch. If uneven, make sure players are alternating between Attack and Defense each time out. Coaching Points: Use proper technique to shield ball, and make sure to check shoulder constantly for Defender&apos;s position, use moves to off balance Defenders and then explode to goal.